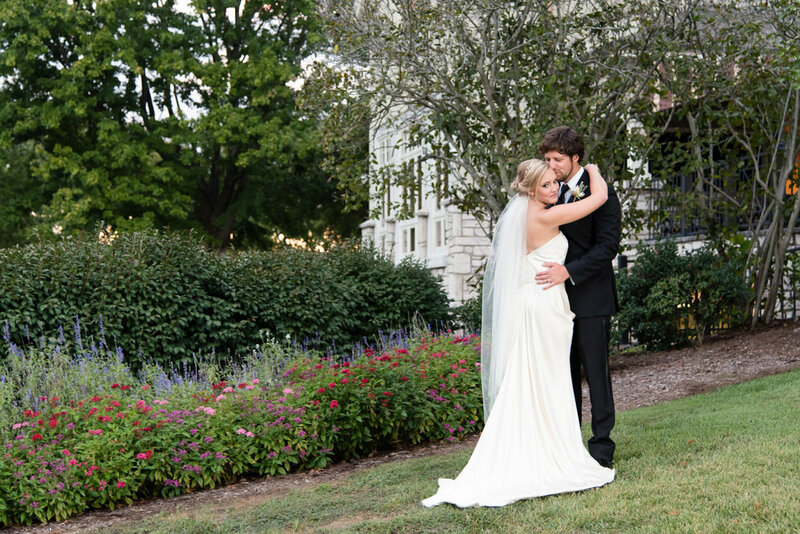 The Vanderbilt Legends Club provides the perfect set up for brides desiring both an outdoor and indoor environment for their wedding event. The North Terrace gives an all-natural backdrop, overlooking the club’s expansive 36-hole golf course. Little needs to be done to further its beauty! 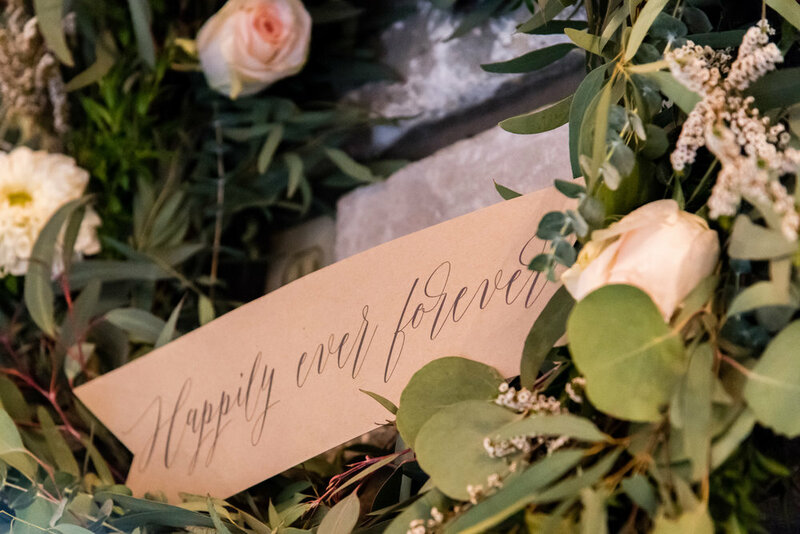 The North Terrace is covered by an awning at all times, giving brides reassurance that their outdoor ceremony will be beautiful in all weather conditions. Equipped with both fans and heaters, wedding guests will be dry and warm in the case of rain as well as shaded on a hot summer evening! 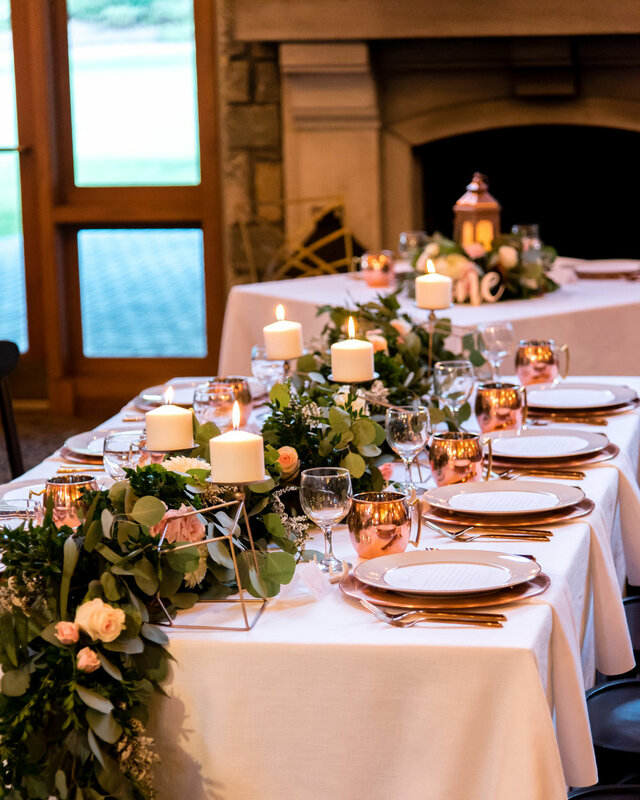 After a perfect outdoor ceremony, guests file directly into the stunning dining area, a perfect combination of casual and elegant with its high, wood-beamed ceilings, chandeliers and stone fireplace. J.J. 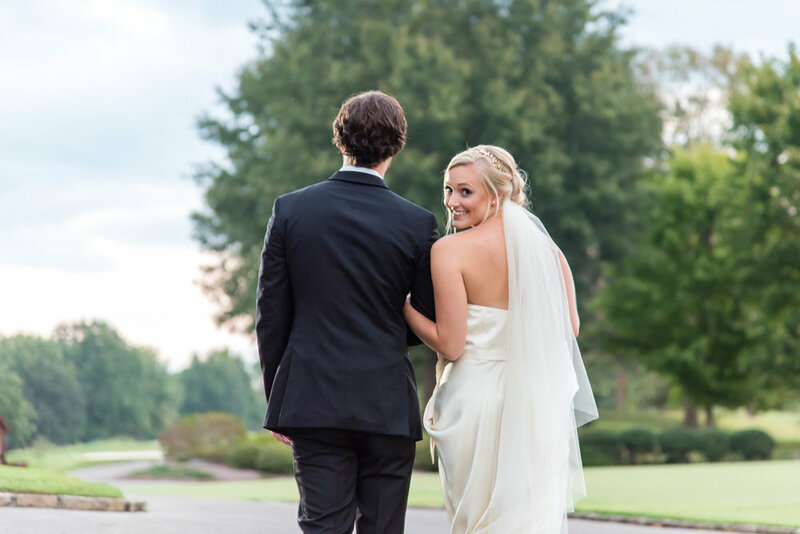 Pair, the Catering and Events Manager at the Vanderbilt Legends Club, is every bride and vendor’s dream. She is available and accommodating, she does whatever she can to help make the vision a reality, and she is simply a joy to work with. 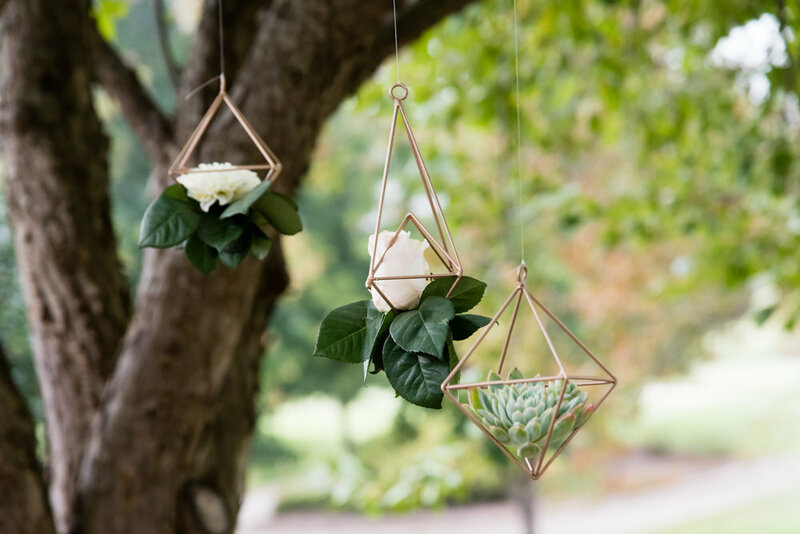 Leah Kutil, designer at Elle Event Style, orchestrated a beautiful, Modern Lodge styled shoot. While keeping the natural beauty of the Vanderbilt Legends Club, vendors came together to add a modern, geometric flare. Tied together, the style is perfect for accomplishing the simple elegance that every bride hopes for and every guest swoons over. 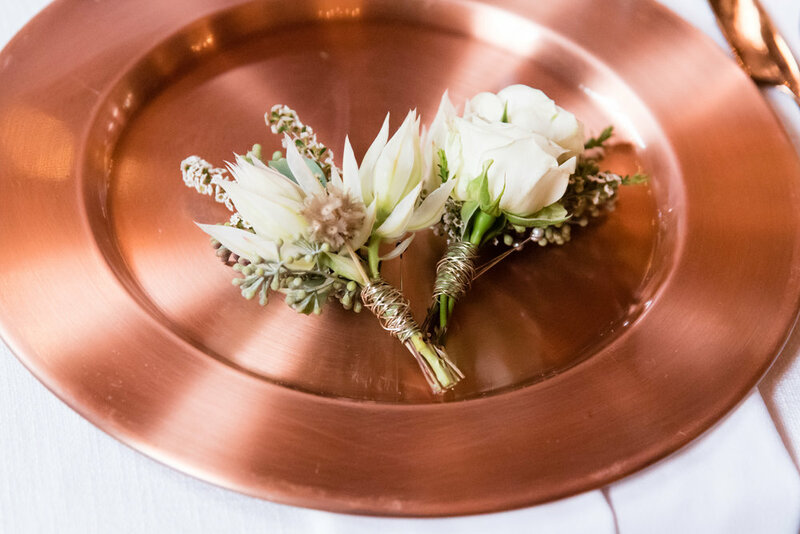 Liberty Party Rental provided their simple, white Panama linens, beautiful copper chargers and Moscow Mule mugs. Topped with sleek, modern china from Classic Party Rental, the table settings are sure to draw the eye of every guest upon entering the room. Classic also provided two types of chairs- a geometric, gold back for the sweetheart table—their Fanfare Chair- Two tone gold—and sleek, wooden chairs to accent the guest tables—their Café Espresso Tuscan Chairs. 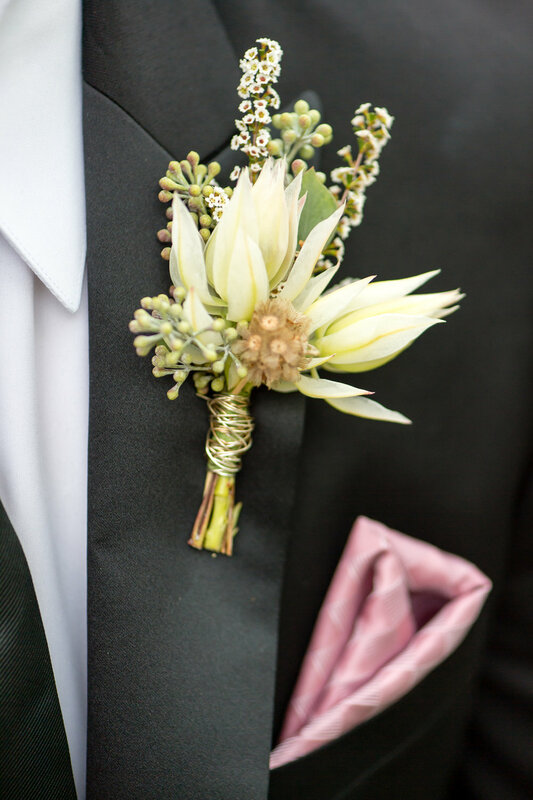 Ashley Walters, Forget Me Not Designs, used a combination of Blushing bride protea, astilbe, astrantia, and dahlias in ivory, blush and green that provided a unique texture for a stunning bridal bouquet. 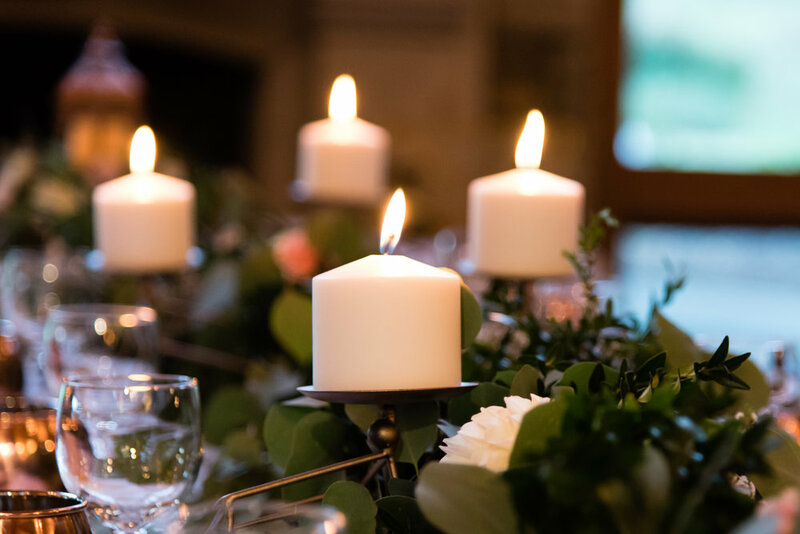 Beautiful greenery lined the fireplace and provided stunning centerpieces for the table-scapes. 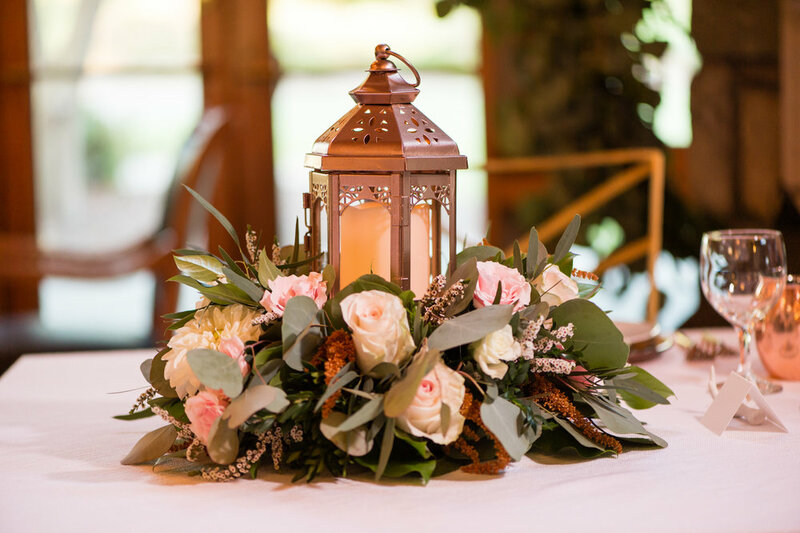 The long table runner woven with geometric candle stands was a beautiful parallel to the centerpiece of the Sweetheart table-a wreath, adorned with a rose gold lantern. 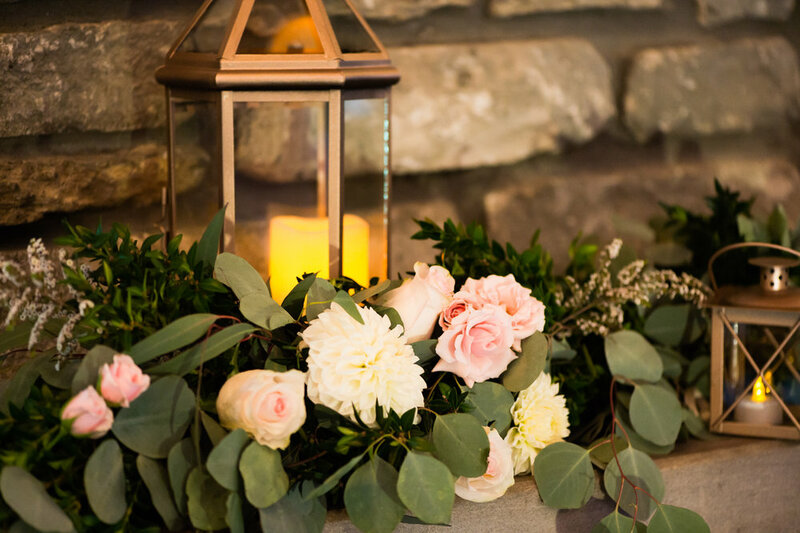 These lanterns can be seen throughout the room and in the ceremony—the perfect highlight for a modern lodge theme. Laura Jenkins, L.ELIZABETH PASTRY, went above and beyond, providing a dessert bar full of YUM. 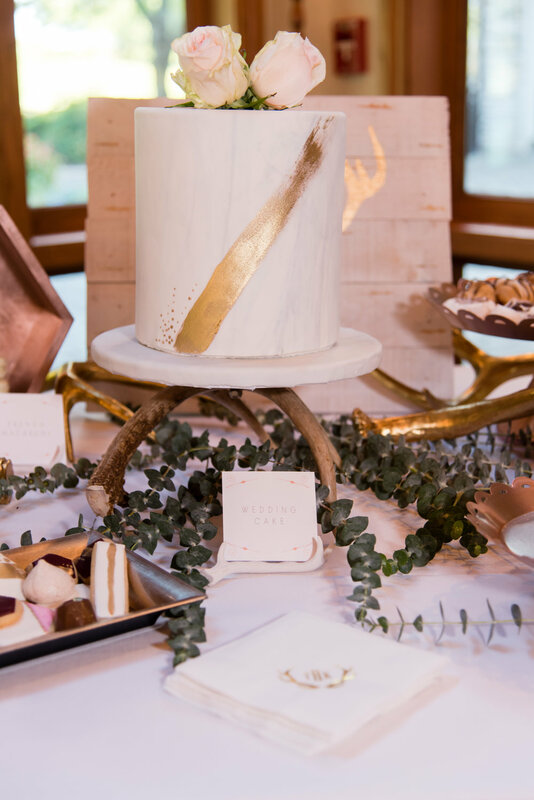 The cake, a marble finish with Gold splashes sat atop a cake stand made of antlers. 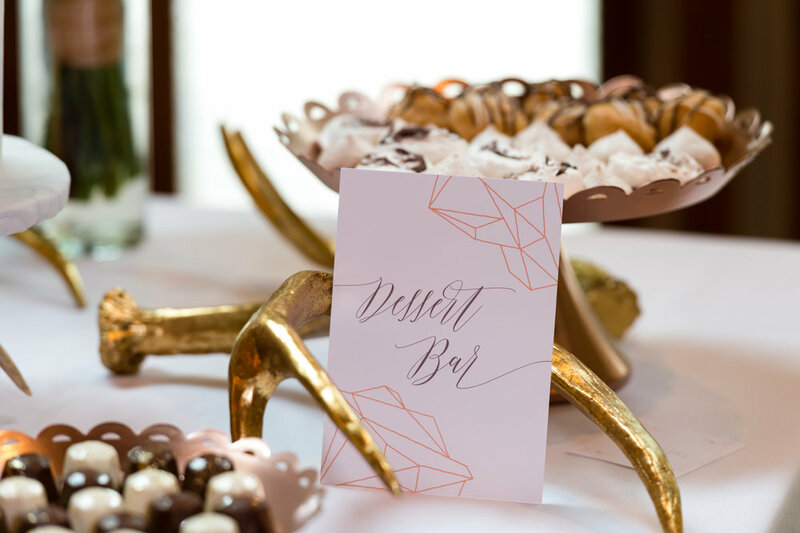 Surrounding the cake were treats of all sorts— cake gems, a modern spin on cake pops, a crowd favorite; sugar cookies, decorated with geometric lines in blush and ivory; macaroons of all sorts; and delicious meringues. The Dessert Bar is sure to be a crowd favorite. 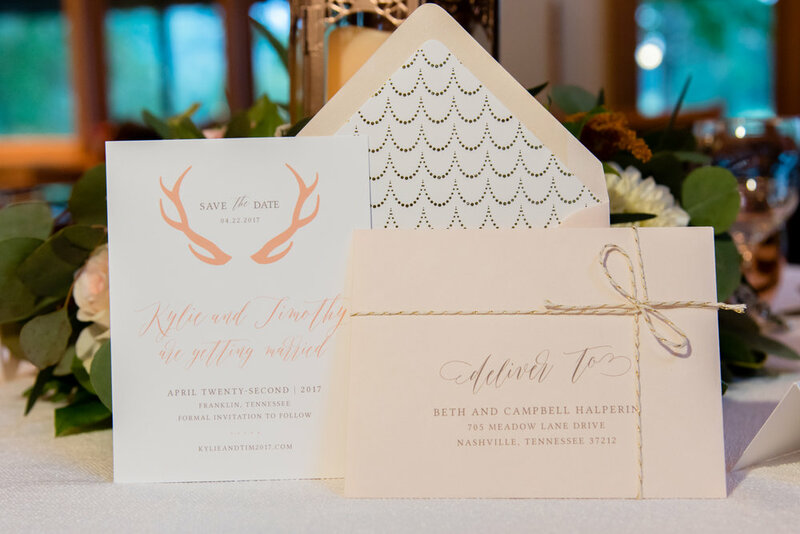 Darby Locklear, owner and designer of DarbyCards, topped off the reception details with beautiful paper goods. An intimate “thank you” note lined the china of each table setting—the perfect solution for a menu substitution. Darby’s designs were the definition of simple elegance, bringing together modern and lodge through symmetry and antler accents. The “Save the Date” and invitation tied in beautifully, as well. 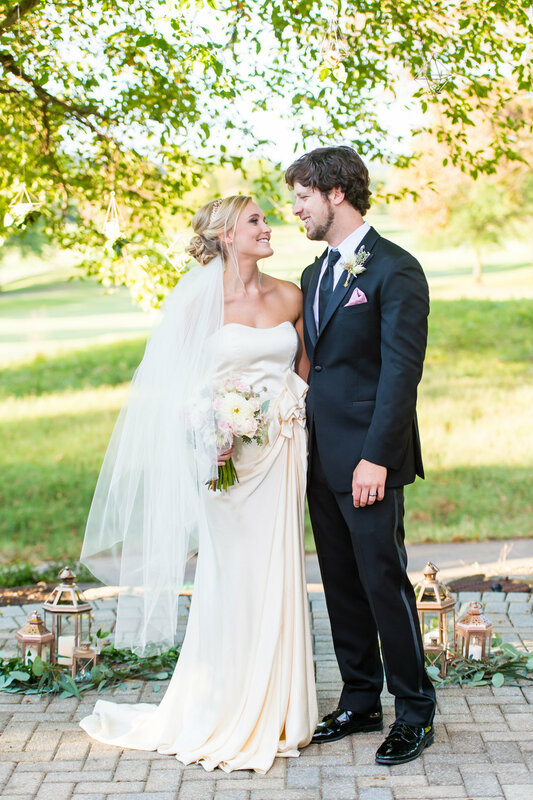 The Bride, Kylie Halperin, wore a modern, Carol Hannah designed gown, provided by Amy with Fabulous Frocks of Nashville. The gown was absolutely stunning on the model and to photograph. 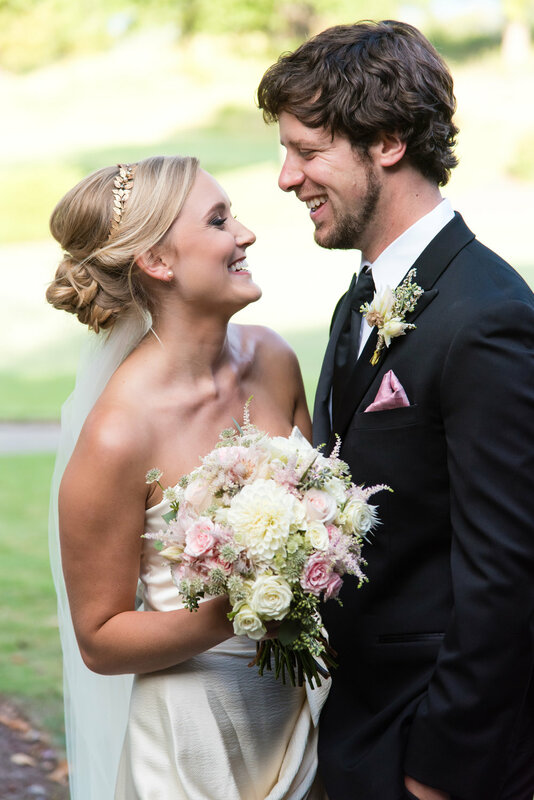 Kylie’s hair, a loose, elegant up-do by Brienna Drnec of The Upper Room Salon, tied in a PARIS by Debra Moreland headpiece and a veil by Toni Federici to add a bit of flare to a simple gown. The headpiece and simple veil were provided by The Bride Room. Her make-up, beautifully accentuating her features in a natural way, was done by Caley Caldwell, Caley Caldwell MUA. 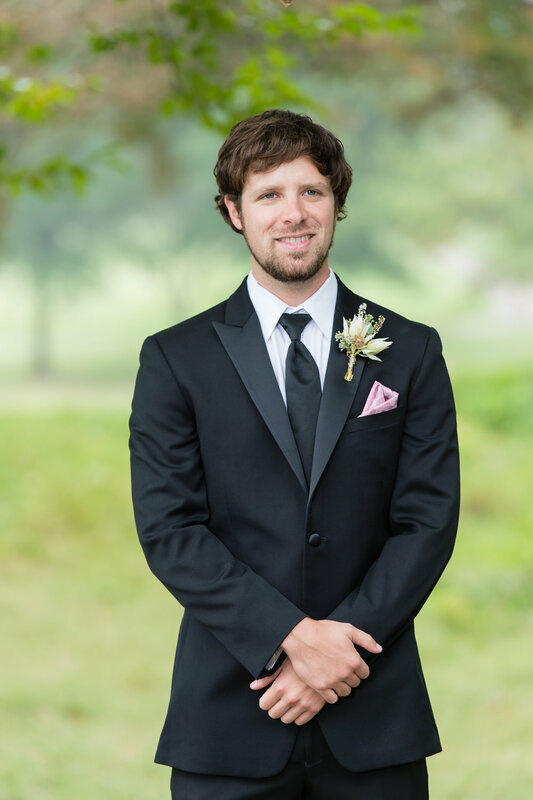 Tim Halperin, Groom, and Max Pair, Ring Bearer, both looked dashing in Street Tuxedo's Black Slim-Fit Tuxedo by Ike Behar. The “Jackson” fit is crafted with a unique and luxurious Italian wool. This one-button tuxedo features a peak lapel, side vents and besom pockets, with coordinating trim fit pants and Dusty Rose accessories. 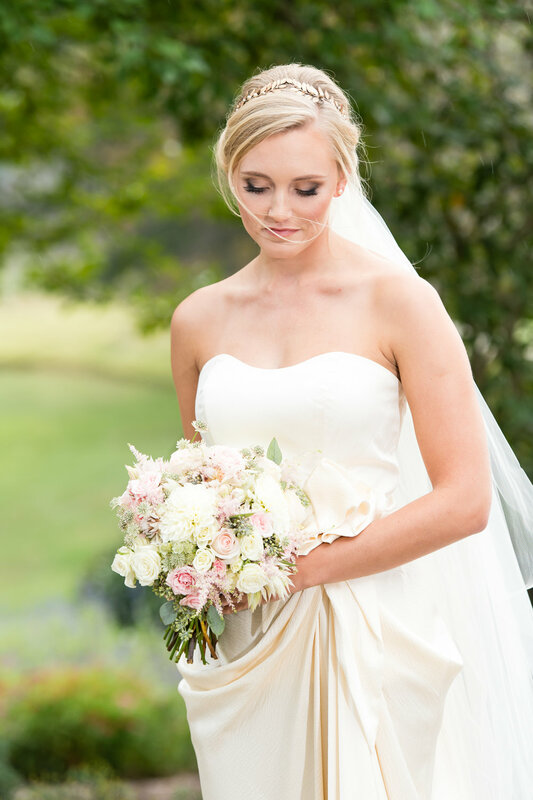 All together, this group of fabulous vendors were able to create a beautiful styled shoot that provides inspiration for a Fall or Spring Bride. This Modern Lodge style is sure to please! 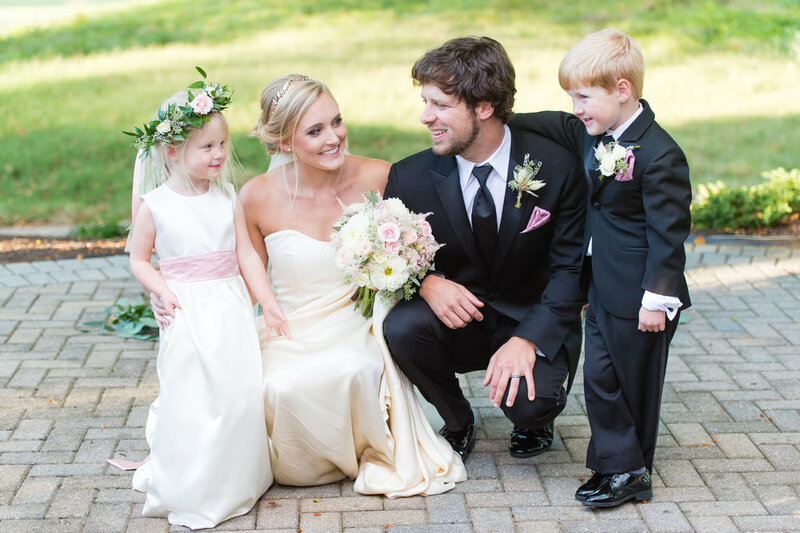 Elle is devoted to gorgeous weddings and happy couples.